The Dhora chair was introduced by Casamilano at the 2017 Milan Design Week. 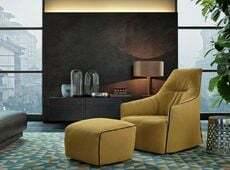 'Casamilano' was born in 1998 as a small family business, and then established on an international level as a manufacturer of design furnishings, being able to ensure the high quality of a Made in Italy item. The Dhora armchair, made by the Italian architect and designer Massimiliano Raggi, fully reflects the ideals carried out by the company, where the elegance and quality of materials are very important. Dhora is characterized by its aesthetic and effective softness: the soft lines of its design lend the armchair a cozy look, which is able to communicate security and dynamism. Dhora is an extremely sophisticated armchair that can be easily adapted to any kind of living environment, from the a classic and rigorous one to a contemporary living. The Dhora armchair has a steel frame and an elegant solid beech wood base coffee colored. The lining can be made in removable fabric or fixed leather. Finally, Dhora is available in the only size cm l. 76 x p.88 x h.40 / 75.